1) T3 was the final swing trade target & although PWE was left on as an Active Long-term Trade (i.e.- trend trade or investment), it was suggested when T3 was hit that “longer-term traders might also consider booking partial or full profits with the intent to re-enter on a pullback or at least raising stops as once again, the odds for at least a pullback or multi-week consolidation on PWE are extremely high right now IMO.” For those long-term traders that either opted to ride out any pullbacks or sold PWE, waiting for an objective re-entry on a pullback to support, this update 60-minute chart lists two support levels worth noting. Although the pullback target for the unofficial short trade was set at 2.32, the actual support level is at 2.26 as I tend to set my pullback targets slightly above the actual support level, especially when the previous trend was very strong, as the case with PWE. 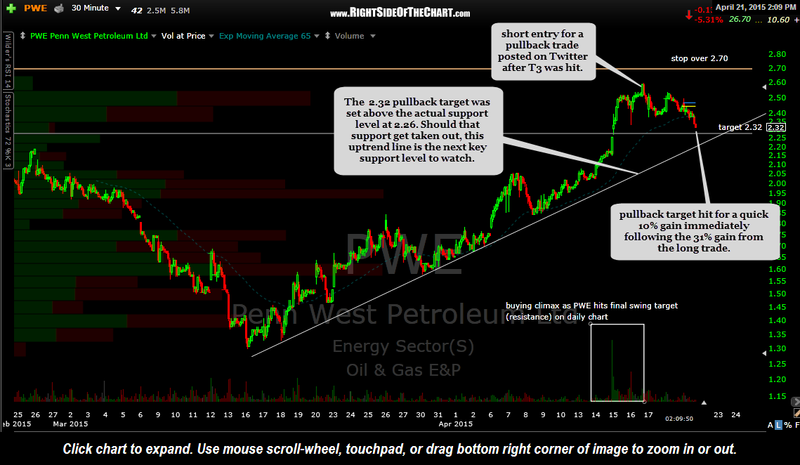 If the 2.26 level is taken out, PWE also has uptrend line support not far below as well. These levels could be useful to longer-term traders as either a level to place stops (slightly below) or to add back any long exposure on PWE in which profits were taken when T3 was hit. 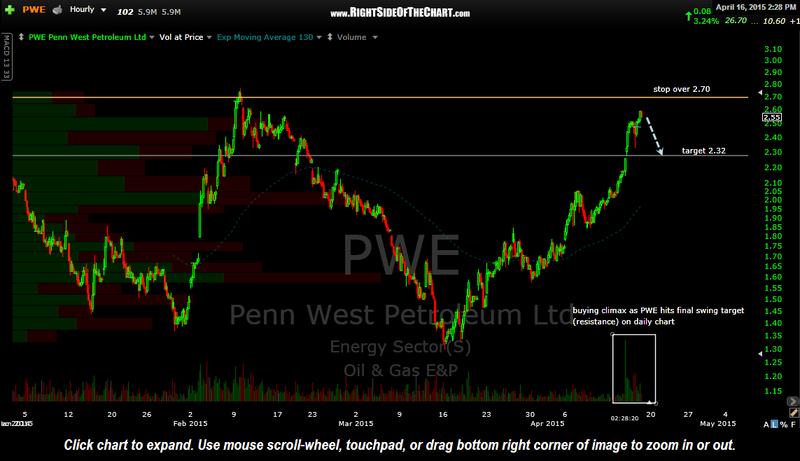 Personally, I’m going to stand aside from here to let the dust settle after such a strong run in PWE as well as crude oil, at least in the near-term. Most likely, I will wait until both PWE and USO take out the top of those large “W” bottom formations that I’ve been highlighting, preferable after the near-term overbought conditions have been alleviated via a pullback in prices and/or some sideways price consolidations. 2) The other purpose of this update is to point out that the pullback target has now been hit for a 10.8% in just 3 trading sessions. This is what I often refer to as micro-managing a trade, reversing from long to short when a price target is hit and the charts confirm that a pullback is likely. 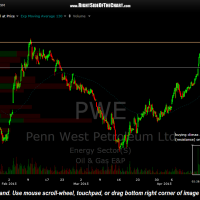 By shorting PWE at 2.60 shortly after closing the long at 2.52, I was able to add a nearly 11% gain on top of the 31.3%, 5 trading session gain from the long trade, thereby essentially booking 42% in gains on PWE in just 8 trading sessions. This is a good example of how active trading, by utilizing technical analysis to hone in the most timely entry & exit points, in addition to the ability to capitalize on moves in either direction (up or down) on a stock can be much more lucrative than buy & hold investing.